As the San Francisco 49ers enter training camp, optimism is soaring in Santa Clara and it’s no secret why. Even though training camp will bring little (if any) new information to the table, all eyes will be on newly-minted franchise quarterback Jimmy Garoppolo. The question: Can Garoppolo sustain the stellar play he showed over the final five games of 2017 for a full season and beyond? With a mere 297 dropbacks to his name, sample size is an obvious concern with Garoppolo when trying to project his play going forward. However, there are plenty of reasons to believe San Francisco has found the real deal at the game’s most important position. Thanks to the excellent work of PFF data scientists Eric Eager and George Chahrouri this offseason, we have a much better understanding of the aspects of quarterback play that are most stable from season to season. Performance from a clean pocket is more stable than play under pressure; Garoppolo was the third-highest graded quarterback from a clean pocket last season. Throwing the ball accurately is key, particularly to open receivers (more than a step of separation); based on PFF’s ball location data, Garoppolo was the third-most accurate quarterback overall and the fourth-most accurate when throwing to open receivers. Even when focusing on aspects of quarterback play that separate the top players from the rest, Garoppolo brought the goods. Jimmy ‘GQ’ was the highest-graded passer under pressure and on third downs – Garoppolo earned a positive grade on an insane 53.3 percent of his third-and-long throws while no one else managed to clear 40 percent – and trailed only Tom Brady and Matt Ryan in grade on ‘NFL Throws,’ essentially our most difficult throws with the highest variance. Garoppolo needs to show improvement on deep passes (20 yards or more in the air) where he completed just 4-of-16 attempts, but just about any way you slice it, the (admittedly limited) data paints a positive picture for the 49ers’ signal-caller. Garoppolo will surely garner most of the headlines, but he’s not the only storyline on offense to pay attention to as we make our way toward real football. Head coach Kyle Shanahan will be looking for Jerick McKinnon, signed to a lucrative deal in free agency, to upgrade a backfield that was arguably the league’s worst in the passing game a season ago. During his final season in Minnesota, McKinnon was one of only three qualifying running backs to earn receiving and pass-blocking grades of 75.0 or higher. San Francisco’s offensive line will feature three new starters this season, with Weston Richburg taking over at center, rookie Mike McGlinchey sliding in at right tackle and former first-round picks Joshua Garnett and Jonathan Cooper battling for the starting right guard spot. If this unit can gel quickly, the potential is there for the 49ers to field its best offensive line since early in Jim Harbaugh’s tenure. San Francisco will also need to figure out how to best utilize second-round pick Dante Pettis early on. Shanahan believes Pettis can play all three receiver positions in his offense, but finding a way to integrate him with the current group of wideouts without putting too much on his plate early on will be important if Pettis is to make an impact in Year 1. How will the defensive back-seven shake out in passing situations? If you want to win games in today’s NFL, you need to be able to defend the pass. And for the 2017 49ers, there was perhaps no greater weakness. San Francisco ranked 27th in PFF coverage grading, and when opposing passers were able to throw from a clean pocket (putting coverage to the test), the 49ers allowed a passer rating of 103.5, ranking 25th. However, with an offseason under their belt, they find themselves ranked 11th in our preseason secondary rankings entering camp. As teams tend to do when they have a clear weakness, the 49ers invested a number of resources to shore up their pass coverage. Even with those new additions, however, a number of questions remain. Former division-rival Richard Sherman is the headliner here. Sherman was still an incredibly effective player in 2017, as he allowed a reception just once every 17.4 snaps in coverage (tied for sixth best) and earned an overall grade of 82.7 (tied for 33rd). What remains to be seen is whether Sherman will be able to return to that level of play in his age-30 season following an Achilles injury. Day 2 of the draft brought a pair of versatile coverage defenders in BYU linebacker/nickel defender Fred Warner and Southern Miss safety Tarvarius Moore. Both players have intriguing skillsets, but both will be playing different positions than they were in college. Warner was an ‘overhang defender’ in BYU’s defensive scheme, which saw him most often align in the slot (over 40 percent of his snaps came in the slot during each of his final two college seasons), but will be asked to play as an off-ball linebacker in San Francisco. Moore maximized his lone season of FBS play, earning an 87.0 overall grade that made him the No. 3 safety in the 2018 draft class on PFF’s board, but his exceptional length and athleticism has the 49ers eyeing him as an outside cornerback in their scheme. While not a newcomer, there’s also the question of what to do with Jimmie Ward. During his time in San Francisco, he’s seen action at both outside and slot cornerback, and was then asked to play free safety in 2017 as the 49ers transitioned to a single-high heavy defensive scheme. Despite being among the more talented defenders on San Francisco’s roster, he enters 2018 without a clear home. As Ward dealt with injury last year, Adrian Colbert assumed the free safety role and doesn’t appear to be letting go any time soon. Ward saw time at outside cornerback during the offseason program, but barring injury it’s difficult to envision him overtaking Sherman or promising second-year player Ahkello Witherspoon there. The most likely fit seems to be in the slot, but even there he faces a roadblock in incumbent K’Waun Williams, who played well down the stretch and finished the year with an 80.2 overall grade. Will Sherman be Sherman again? Can Warner overtake veteran Malcolm Smith while adapting to a new position? How does defensive coordinator Robert Salah find a way to get talented players like Moore and Ward on the field for a significant number of snaps? 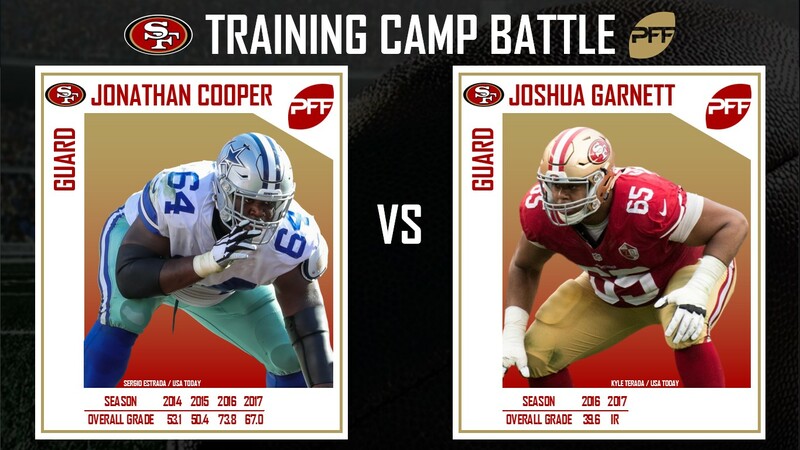 Along with hoping young players like Witherspoon, Jaquiski Tartt and Reuben Foster (whose concern is more staying on the field than what he’s doing once he’s on it) can develop into the cornerstones of their pass defense, these are the questions San Francisco will need to sort out over training camp and the preseason in order for this unit to take a step forward in 2018. The optimism in San Francisco isn’t unreasonable. They have one of the league’s more promising head coach/quarterback pairings in Shanahan and Garoppolo, which are the two most important pieces to the puzzle. 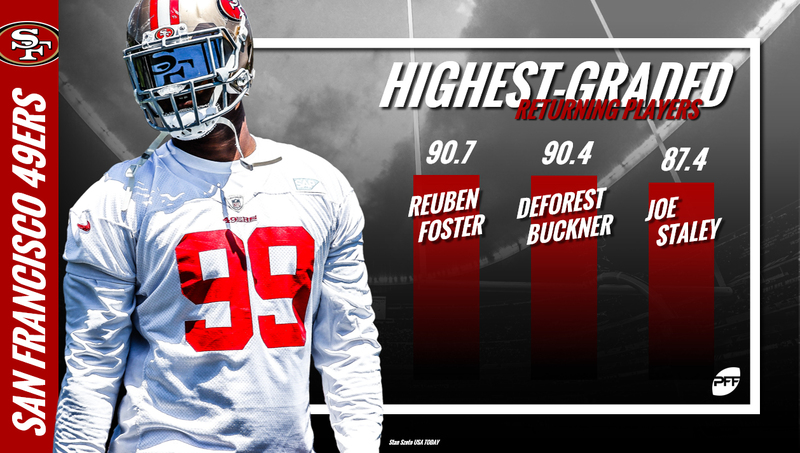 They have a pair of elite defenders in DeForest Buckner and Foster, both of whom earned overall grades of 90.0 or higher last season. John Lynch and the rest of the front office has done an admirable job restocking a previously awful roster with talented young players. However, this is still a team with a number of question marks in need of a positive answer if they hope to be serious playoff contenders in 2018. Training camp marks the first opportunity to start answering some of them.